An outdoor kitchen may be a simple enclosed grill to a completely outfitted cooking and dining area, with cooktop, refrigerator, sink and more. The entertaining value is high and so is the value of this addition to your home. Some outdoor kitchens can add up to 130% of their cost to your residential property. Many Seattle area homeowners include a top cover for their outdoor kitchens to keep the rain out and enjoy year-round use. See covered-areas for design ideas. We recommend using high quality materials that will survive all kinds of weather conditions, such as granite countertops and stainless steel appliances. 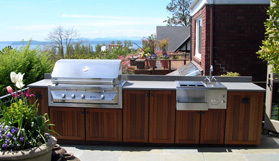 We work with you to conceptualize and design your new state-of-the-art outdoor kitchen.